Some of my very first memories revolve around lollipops. One event that would occur often was a trip to the bank drive thru. It was like clockwork: mom drives through the bank, and a lollipop magically appears every.single.time. Needless to say, I loved those trips to the bank. 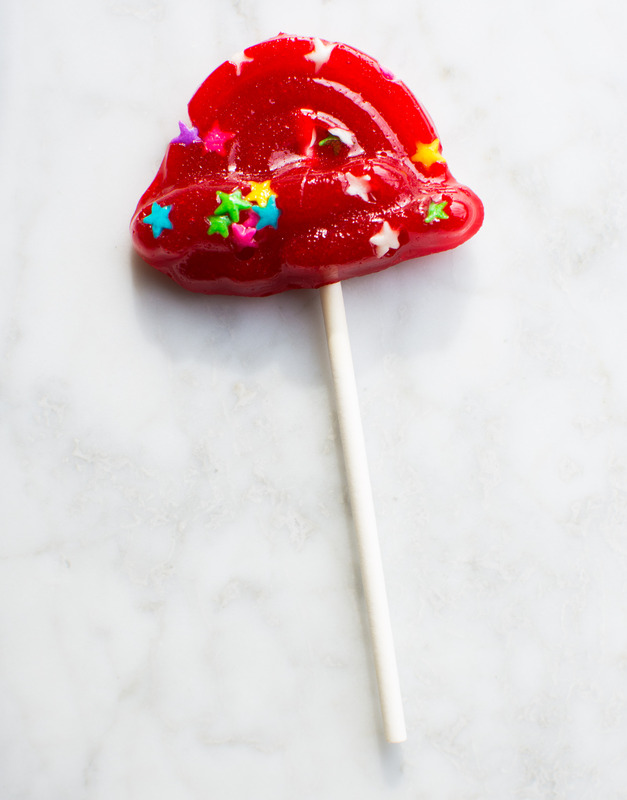 Then there’s the Valentine cherry lollipops. Those sweeties seemed to be better than any other lollipop given (and eaten) throughout the year. I still recall digging through the valentines searching not for love notes, but cherry lollipops. I had forgotten about this childhood obsession until, well, I had my own children and they started bringing home lollipops. It was a flash to the past that I welcomed with open arms. There are times I’ve even apprehended their sweet treats because they didn’t “need the sugar” but the truth was I wanted the sugar. Me! I may not be a Cookie Monster, but I’m definitely a Candy Monster (and candy thief too if we are going to get technical about it). However, as it is in my world, I’ve developed a habit with foods I find myself buying often. If I enjoy eating it, I might as well learn to make it. Lately that has been the case with candy. And truth be told, I was surprised by how little effort it takes. 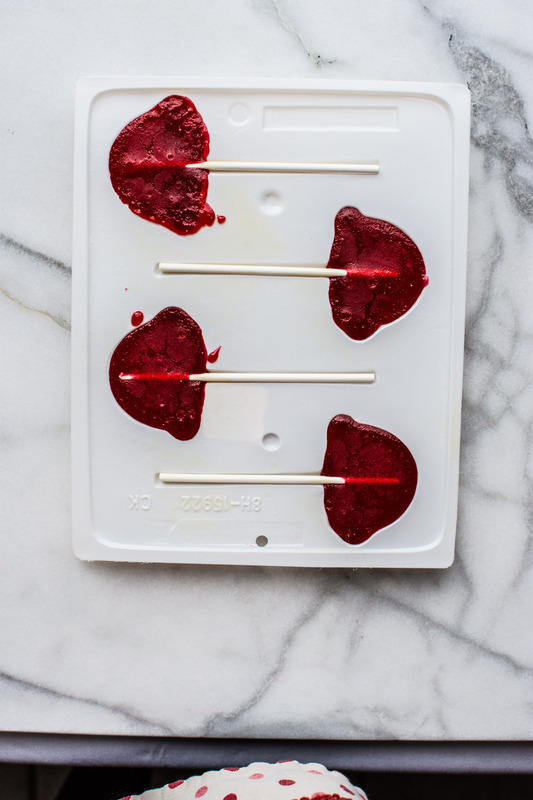 There are three bits of information that are critical to candy making: 1– a good kitchen thermometer is a must. It is going to tell you when the corn syrup has reached 300 degrees; the temperature for hard candy to develop. You need to be able to accurately know the temperature of the corn syrup, and that requires a good thermometer. 2– corn syrup is your best friend. It is the basis of candy. Once heated to the correct temperature it hardens once cooled. If you’re like me and become quickly obsessed with candy making you’ll want to grab a large container of it at Market Street to make all your candy dreams come true. 3– a watchful eye is mandatory. Bringing corn syrup to 300 degrees happens in about 7 minutes on high heat. Even allowing the corn syrup to get 5 to 10 degrees hotter can affect the outcome of the candy (trust me— I’ve NOT had a watchful eye several times). From this point flavorings can be added at the end of the heating process. Want to have lemon lollipops? 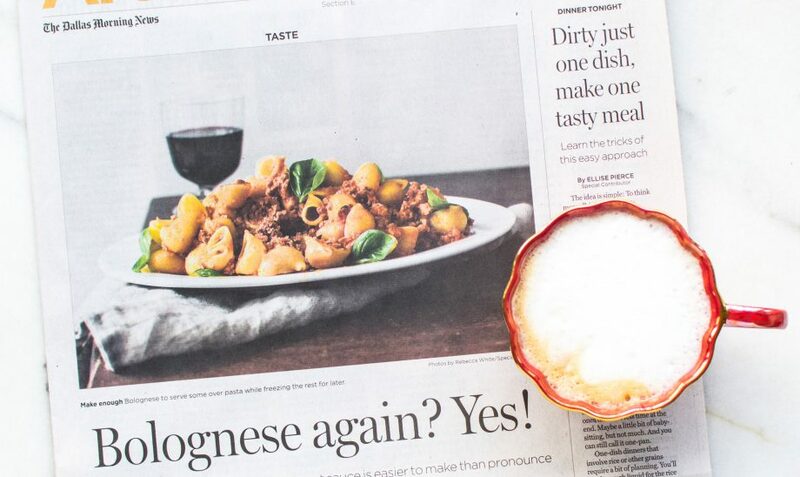 Grab some lemon extract and lemon zest. What about peppermints? Stir in peppermint extract and maybe some green food coloring into the mixture. Be creative how you flavor your candy! 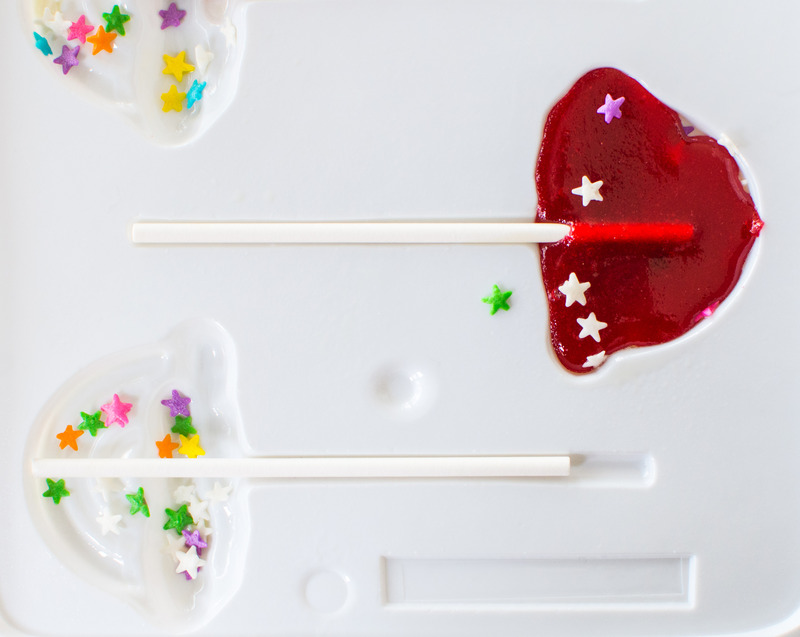 Now to the piece de resistance— cherry lollipops. I went with cherry flavored gelatin from Market Street to be the basis of the flavor (but also grabbed some Jello’s Simply Good Raspberry Lemonade gelatin mix for a rainy day). I was extremely happy with the end result. 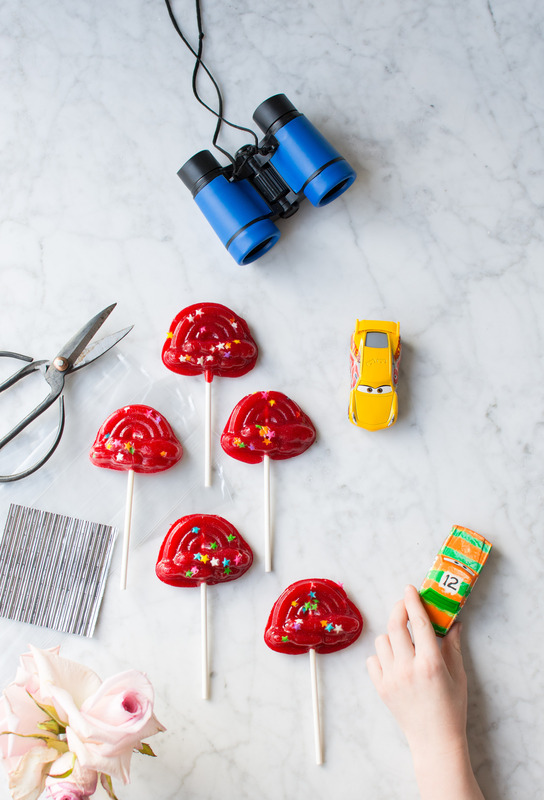 I’ve been working on homemade lollipops since Halloween and I’ve decided it’s time to let the kids join me (plus spring break is coming up and we allll need a couple of projects planned, right?). My idea? Sprinkles. Having kid assistance is tricky with lollipops because of the extremely hot syrup. 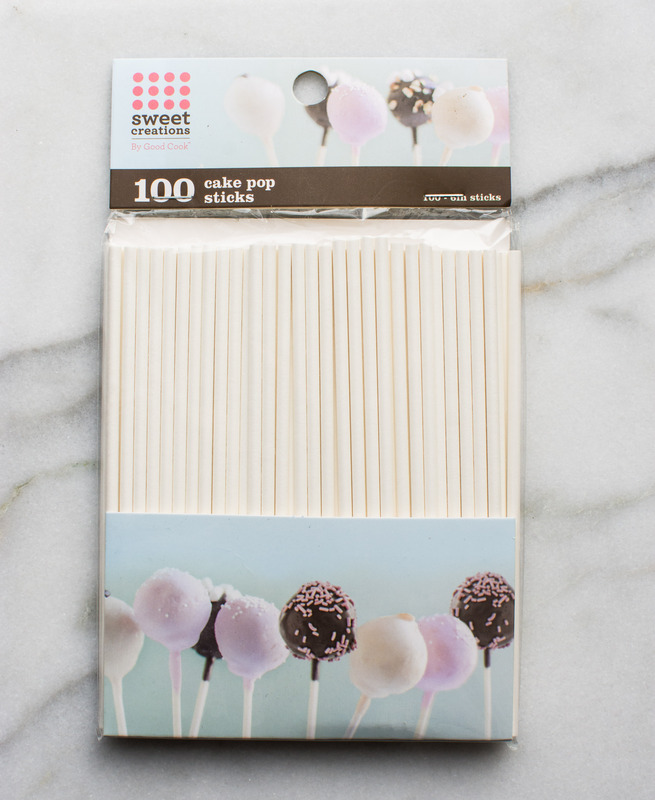 However, they can help with picking out sprinkles from Market Street and adding them into the candy molds before and after the lollipop mixtures has been spooned out. They’ll be chanting best.mom.ever. 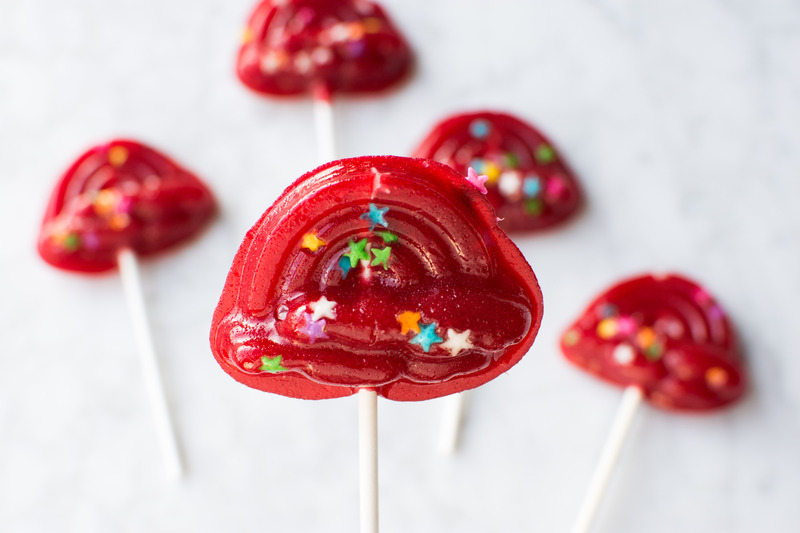 and who knows, you might even be central to their lollipop memories because it’s Spring Break and you’re making homemade lollipops together. Author note: If the treat sticks are too long, trim the ends before using. 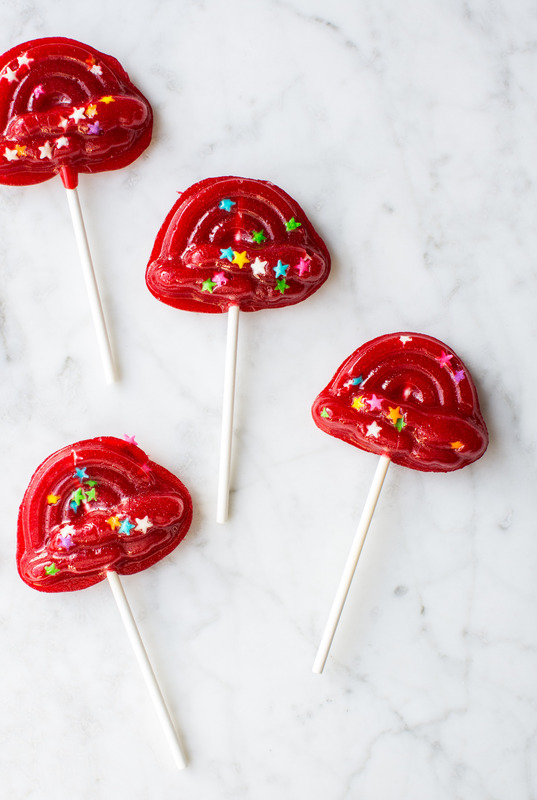 These lollipops can be made by simply placing the mixture on a silicone baking mat in your desired size, or by using candy molds. Both methods are described. Line two rimmed baking sheets with silicone baking mats. If using candy molds, spray the molds with canola oil and then place the treat sticks inside the indentations. Place the sugar, corn syrup and water into a small saucepan. Bring to a quick boil over high heat. Once the temperature reaches 300 degrees. Remove from the heat and quickly stir in the jello. Working quickly, spoon the warm mixture into the molds. Top with sprinkles. If using the baking mats, quickly spoon the mixture onto the mat two inches apart. Place the sticks into each lollipop. Top with sprinkles. 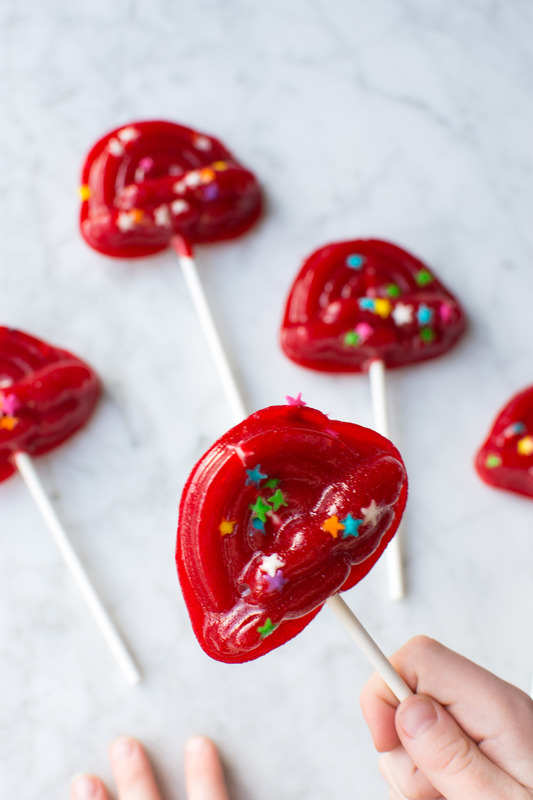 Let the lollipops cool, about 30 minutes. Wrap in cellophane and store in a cool dry place. This entry was tagged a pleasant little kitchen lollipops, cherry lollipops, cook with kids, dallas food blog, dallas food blogger, homemade lollipops, how to make lollipops, spring break activity, texas food blog, texas food blogger. Bookmark the permalink.